Selective color change is a wonderful digital retouching tool for your images that allows altering only one specific color while keeping the rest of them unchanged. 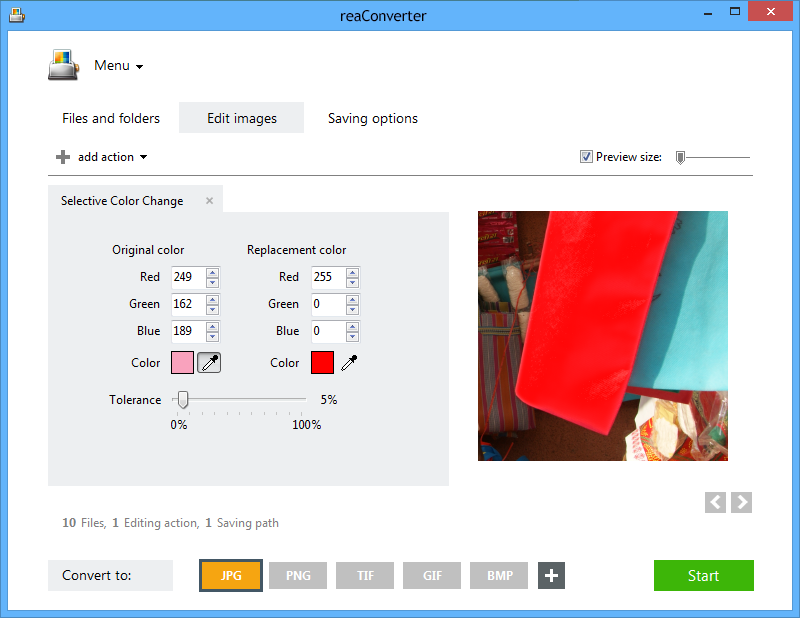 With reaConverter's latest version, you can easily use a color picker to select the original and the replacement color. For example, you can choose to change picture background from one color to another. reaConverter allows you to control the intensity of the change, by offering a handy scroll bar to adjust Tolerance. All the changes you operate on your image can be checked in real time by ticking the Preview box. Open one or more images you intend to edit. 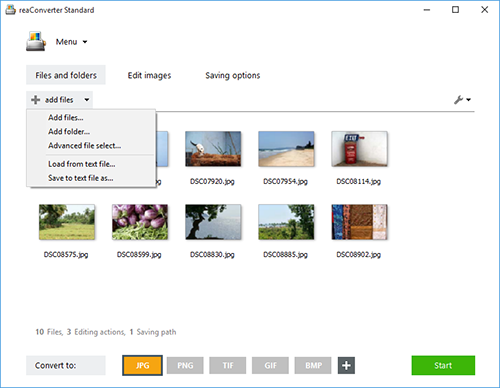 Select them one by one, add entire folders or use the drag-and-drop tool. Go to the Edit images tab, click Add action → Creative retouching → Selective color change. In this new window you will be able to pick the color you intend to change and the one you intend to use as replacement. Adjust the intensity of the change using the Tolerance scroll bar. Go to the Saving options tab and decide on a location for your newly retouched files. Save them in a local folder or in your Google Drive, Box.net, Dropbox or SkyDrive cloud. Before starting the editing process, you can also pick a new extension for your images. 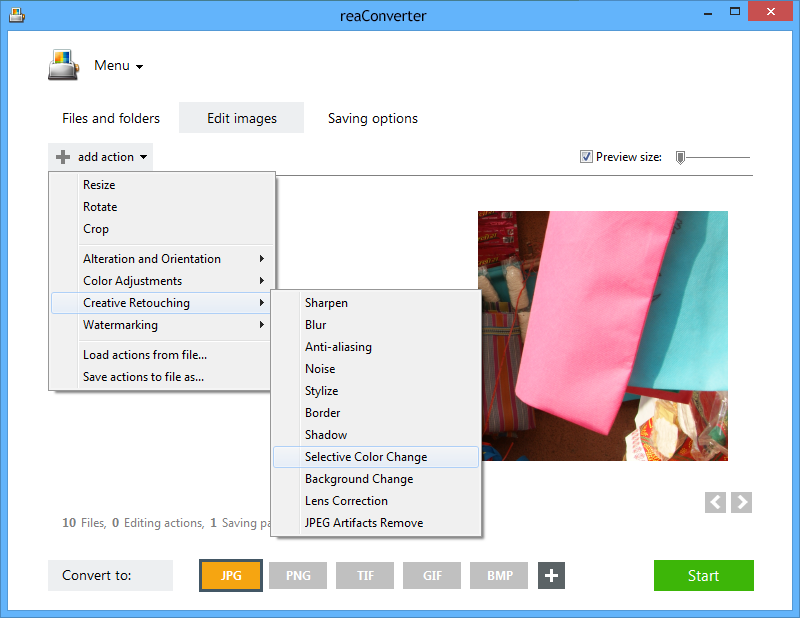 reaConverter supports conversion in and from over 40 image extensions. Select the one you prefer by simply pressing the desired button from the lower part of the screen. Finally, click Start and your newly edited images will soon be ready! Command-line color replacement tool is an advanced feature meant for professional use, and is available in Pro edition only.